Lets first see what is netware ? NetWare is a network operating system (NOS) that provides transparent remote file access and numerous other distributed network services, including printer sharing and support for various applications such as e-mail transfer and database access. To enable welcome screen login, you need to disable the netware client services. 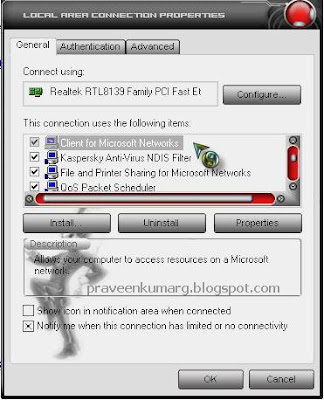 How to disable netware client services? 1. Go to Control Panel –> Network Connection . This will open up the network connections available on your computer. 2. Right click on the connection and select Properties. 3. In general tab, uncheck the option for Client Services for NetWare and press OK.
4. Repeat step 2 and 3 for all the connections shown in network connections. 6. To enable welcome screen now, go to Control Panel –> User Accounts –> Change the way users login and select the option Use Welcome Screen. This will slove your Problem.